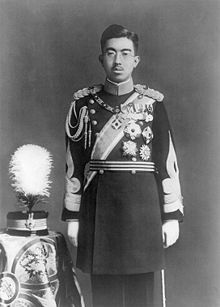 Hirohito (裕仁), posthumously in Japan officially called Emperor Shōwa or the Shōwa Emperor (昭和天皇 Shō), was the 124th Emperor of Japan according to the traditional order, reigning from December 25, 1926, until his death in 1989. Although better known outside of Japan by his personal name Hirohito, in Japan he is now referred to exclusively by his posthumous name Emperor Shōwa. The word Shōwa is the name of the era that corresponded with the Emperor's reign, and was made the Emperor's own name upon his death. At the start of his reign, Japan was already one of the great powers � the ninth largest economy in the world after Italy, the third largest naval country, and one of the five permanent members of the council of the League of Nations. He was the head of state under the limitation of the Constitution of the Empire of Japan during Japan's imperial expansion, militarization, and involvement in World War II. After the war, he was not prosecuted for war crimes as others were. During the postwar period, he became the symbol of the new state. The war situation has developed not necessarily to Japan's advantage.